Jim Kingwell helps Suzanne Kindland form a piece of glass work at their studio at Icefire Glassworks in Cannon Beach. Suzanne Kindland practices the art of glass at Icefire Glassworks. Jim Kingwell helps Suzanne Kindland form a piece of glass work at their studio at Icefire Glassworks in Cannon Beach. Suzanne Kindland and Jim Kingwell at IceFire. Jim Kingwell pulls molten glass out the furnace while working on a piece at Icefire Glassworks. Watching a glass artist at work, it can be difficult to detect the premeditation and reasoning behind their series of actions, which at times come across curious and confusing. As the process continues, however, a shape emerges, colors become visible, and the finesse and precision prompting the artist’s movements and choices manifest into a resplendent piece of glasswork. “Glassblowers, we work with some the most common materials in the crust of the earth,” said artist Jim Kingwell, of Icefire Glassworks in Cannon Beach. In an elegant marriage of artistry and alchemy, they start with those rudimentary materials, employ fire and air, shaping and transforming liquid glass into beautiful, impermeable objects. As Kingwell pointed out, humans long have been modifying simple and abundant elements found within their environment. Glassblowing, for example, is not a new practice, nor confined to a single civilization. The technique was invented by Syrian craftsmen around the first century, B.C. The technique was further developed during the Roman Empire, with Phoenicians setting up workshops in modern-day Lebanon, Israel and Palestine, and throughout the Middle Ages, the Renaissance, and the Art Nouveau period. During those eras, people created work on a smaller scale, with limited output. The Industrial Revolution changed that, Kingwell said. While the revolution helped increase productivity, it put an economic strain on craftsmen in all fields, including glassworking, and much individuality was lost in the process. “The start-to-finish work of one pair of hands and associated knowledge was devalued by factory production,” Kingwell said. In a sort of empowering deconstruction of the factory process, Kingwell and the other artists whose work is displayed at Icefire create their art from start to finish. They design pieces that are original and cannot be duplicated, even by the artist themselves. The alternative, Kingwell believes, is accepting limitations and accomplishing something that could have been done by a machine. One of Kingwell’s primary motivations as an artist is self-identifying. He believes all humans innately possess artistic characteristics: the drive to connect with basic elements, to create an item of worth, to express a facet of oneself. 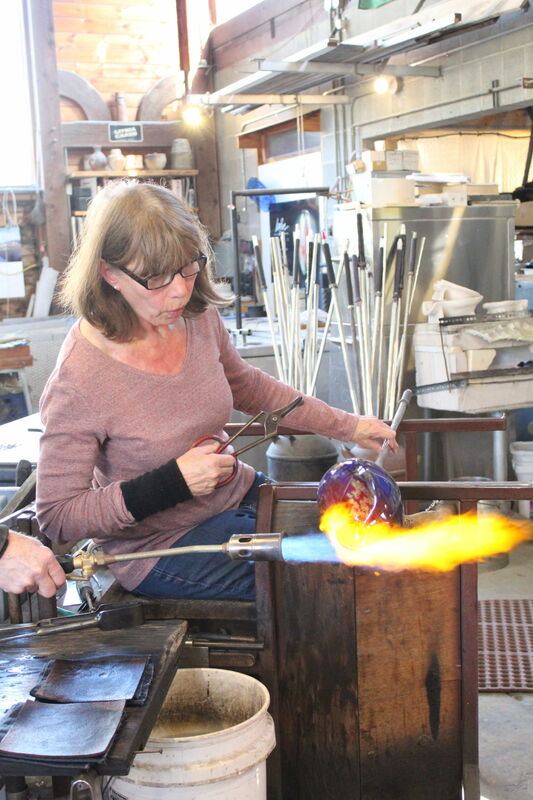 Icefire Glassworks houses the studio used primarily by Kingwell and glass artist Suzanne Kindland. However, the establishment also doubles as a gallery for exhibiting and selling the creations of serious artisans that work with a demanding, even risky, medium. The artists on display, who have individual skill sets and techniques, include Michelle Kaptur, Mark Gordon, Pamela Juett, Robert Tamis, Steve Krig, and Kathleen Sheard. “We become a catalyst for building relationships,” he said. Many people surround themselves with material items that are there by default, rather than being selective and choosing only items that give their life meaning and joy. Art is an exception. People develop an intuitive connection to a creation that has meaning within the context of their individual life and hunt for self-worth, Kingwell said. Galleries provide a connection point for individuals to find artwork they respond to and value. Kingwell also feels gallery owners have a responsibility to help educate customers, particularly about the criteria for judging a piece of glass work, as they often feel insecure dealing with an unfamiliar medium. “They walk in here and discover things they didn’t know,” he said.